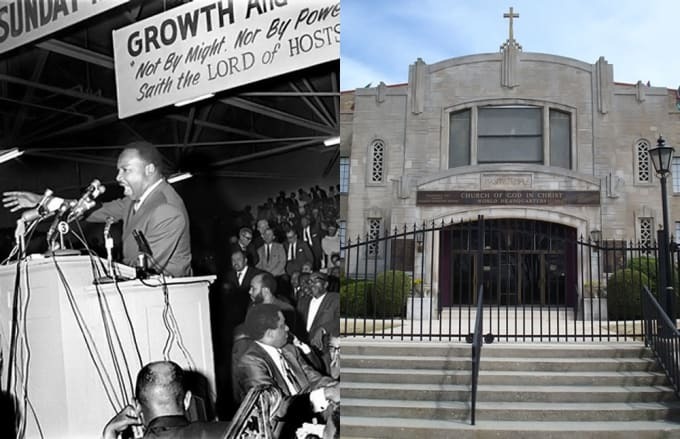 Location: 930 Mason St., Memphis, Tenn.
Martin Luther King, Jr. delivered his final speech, "I've Been to the Mountaintop," at the Mason Temple in Memphis one day before his assassination. Largely concerning the Memphis Sanitation Strike, the speech asked the United States to live up to its ideals. Eerily prophetic, King alludes to the possibility of an early death, saying that while he would "like to live a long life," God had allowed him to "go up the mountain" and see the "Promised Land." King noted that he "may not get there" with everyone, but he was not "worried about anything." After enduring what he did in an effort to change the world, King had to know that an untimely demise was a possibility. In spite of that, he never once showed that he was under duress. The temple, named for Bishop Charles Harrison Mason, is the International Sanctuary and headquarters for the Church of God in Christ. Founded by Mason, it's the larges African-American Pentecostal group in the world.